The American ENIAC is customarily regarded as the first electronic computer, but this fascinating book argues that in reality Colossus - the giant computer built in Bletchley Park by the British secret service during WWII - predates ENIAC by two years. CBI - China: Day 136 of 142 of the 1st Battle of Hebei. Eastern Europe: Czechoslovakia and the Soviet Union sign a five-year Treaty of Mutual Assistance. Spain: Day 304 of 985 of the Spanish Civil War. Spain: Day 669 of 985 of the Spanish Civil War. CBI - China: Day 314 of 2,987 of the 2nd Sino-Japanese War. Day 99 of 124 of the Battle of Henan. Canada: In Halifax harbor, Nova Scotia, gold from two British warships is transferred to trains for delivery to Ottawa. CBI - China: Day 679 of 2,987 of the 2nd Sino-Japanese War. Day 27 of 35 of the Battle of Suizao. CBI - Mongolia: Day 6 of 129 of the Battle of Khalkhin Gol, a border dispute between the Soviet Union and Japan. USA: President Roosevelt asks the US Congress to appropriate a total of $1,182,000,000 for National Defense purposes (that's over a billion). USA: President Roosevelt responds to Churchill's telegraph from yesterday, noting that any aid to Britain must have authorization from Congress. ETO - Norway: Day 38 of 63 of the Battle of Norway. ETO: Day 7 of 8 of the Battle of The Netherlands. Although the Dutch have surrendered, it takes a while for the word to get out. ETO - Belgium: Day 7 of 19 of the Battle of Belgium. German 6th Army breaks through the Dyle Line. British troops withdraw from Louvain while the Belgian government begins evacuating Brussels for Ostend. ETO - France: Day 7 of 44 of the Battle of France. German panzers break through the French line at Sedan and advance to Montcornet and Avesnes-sur-Helpe. ETO - Italy: Churchill warns Mussolini to stay out of the war. When he asks French PM Reynaud about his strategic reserve, the answer is "aucune" (there is none). CBI - China: Day 1,045 of 2,987 of the 2nd Sino-Japanese War. Day 184 of 381 of the Battle of South Guangxi. Day 16 of 49 of the Battle of Yichang. Atlantic: German bombers sink the British troopship ARCHANGEL 10 miles off Aberdeen, Scotland. Atlantic: German sub U-105 sinks the British ship RODNEY STAR 400 miles west of Sierra Leone, British West Africa. Atlantic: German sub U-109 stumbles upon an American fleet consisting of a battleship and several destroyers. Wisely, she dives down and avoids them. ETO - UK: Day 253 of 258 of the Blitz. The Luftwaffe night bombs Birmingham. After this, the Luftwaffe begins transferring east for the upcoming invasion of Russia. ETO - France: French Marshal Philippe Pétain issues a radio broadcast approving collaboration with Hitler. ETO - Germany: The RAF makes a night raid on Cologne and Bramsfield. MTO - Malta: German bombers damage the British destroyer HMS ENCOUNTER in drydock at Malta. MTO - Greece: The final British reinforcements arrive on Crete just as the Luftwaffe bombs various positions on the island and shipping in Suda Bay. MTO - Libya: Day 37 of 256 of the Siege of Tobruk. The Italians clear a path through the wires and mines and capture several Australian bunkers. Middle East: Day 15 of 30 of the Anglo-Iraqi War in Iraq. German ME-110s and HE-111s bomb the RAF airfield at Habbaniyah while to the west German fighters attack the British reinforcements coming from Palestine. East Africa: Day 341 of 537 of Italy's East African campaign in the lands south of Egypt. With drinking water fouled in Amba Alagi, Abyssinia, the Italian Viceroy Duke of Aosta asks the British to send in fresh water. When the British refuse, he begins surrender negotiations. CBI - China: Day 1,410 of 2,987 of the 2nd Sino-Japanese War. Day 10 of 21 of the Battle of South Shanxi. Atlantic: Day 123 of 169 of Germany's Second "Happy Time," during which U-boats sink 609 Allied ships with little risk. U-506 damages US tankers SUN and WILLIAM C MCTARNAHAN and sinks US tanker GULFOIL south of New Orleans, Louisiana. Russian Front - North: Day 251 of 872 of the Siege of Leningrad. Russian Front - North: Day 98 of 102 of the Battle of the Demyansk Pocket, another failed attempt to break the siege at Leningrad. Russian Front - North: Day 12 of 658 of the Siege of the Kholm Pocket. Russian Front - South: Day 5 of 17 of the 2nd Battle of Kharkov, Ukraine. The Soviets mount yet another offensive attempt, but are held. Russian Front - South: Day 199 of 248 of the Siege of Sevastopol, Crimean Peninsula. Russian Front - South: Day 9 of 12 of the Battle of the Kerch Peninsula, Crimea. German troops capture Kerch. Soviet troops in the area begin a 5-day evacuation by ships while under heavy fire. MTO - Libya: The RAF makes first use of Kittybombers (special racks mounted on a P-40 to carry a 500 lb bomb) by bombing an enemy camp near Bomba. East Africa: Day 12 of 186 of the Battle of Madagascar. CBI - Burma: Day 154 of 164 of Japan's Invasion of Burma. US 10th Air Force B-17s bomb the airfield at Myitkyina making the runways unusable. CBI - China: Day 1,775 of 2,987 of the 2nd Sino-Japanese War. Day 2 of 124 of Japan's Zhejiang-Jiangxi Campaign, launched to punish anyone suspected of aiding the Doolittle raiders in China. Roughly 250,000 Chinese will be killed. PTO - Malaya: Day 87 of 357 of the Battle of Timor Island. PTO - New Guinea: US 5th Air Force B-25s, B-26s and B-17s hit the airfield and storehouses at Lae and seaplane base at Deboyne Island. 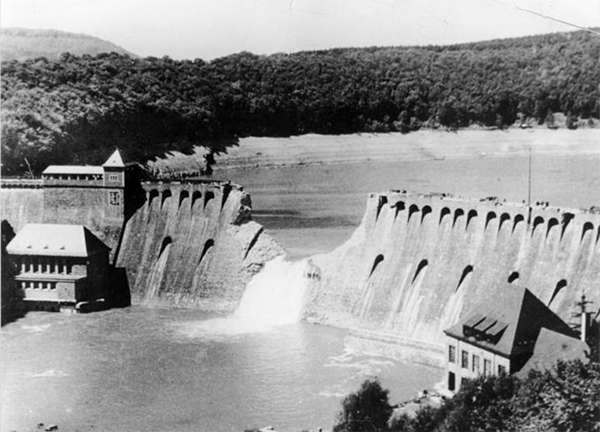 ETO - Germany: Operation CHASTISE: RAF Dambusters bust the Möhne and Edersee Dams in overnight raids using specially developed "bouncing bombs" causing catastrophic flooding of the heavily industrialized Ruhr valley and the death of many civilians, but causing little direct harm to the intended industrial facilities. 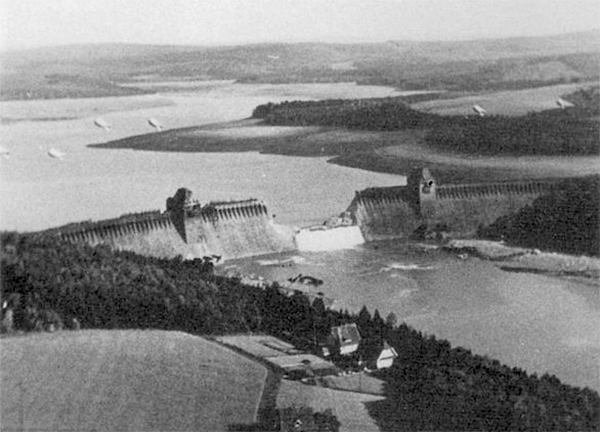 Note the six Barrage balloons above the dam "protecting" it from attack by enemy aircraft. The raid was costly. Fifty-three of the 133 aircrew who participated in the attacks were killed, a casualty rate of almost 40%. 13 of those killed were members of the Royal Canadian Air Force, while 2 belonged to the Royal Australian Air Force. Initial German casualty estimates from the floods when the dams broke were about 1,294 killed, which included 749 French, Belgian, Dutch and Ukrainian prisoners of war and laborers. Germany: The Nazis declare Berlin to be "Judenfrei" (cleansed of all Jews). Germany: The Warsaw Ghetto Uprising ends in Poland with the destruction of the Warsaw synagogue. In Jürgen Stroop's final daily report, he notes that 180 Jewish fighters were killed on this final day. Russian Front - North: Day 616 of 872 of the Siege of Leningrad. Russian Front - North: Day 377 of 658 of the Siege of the Kholm Pocket. MTO - Italy: US 12th Air Force RAF Wellingtons night bomb targets at Trapani. CBI - China: Day 2,140 of 2,987 of the 2nd Sino-Japanese War. Day 5 of 23 of the Battle of West Hubei. PTO - Alaska: Day 344 of 435 of the Battle of Kiska, Aleutian Islands. Day 6 of 20 of the Battle of Attu. US 11th Air Force provides air support. PTO - Japan: The USS SNOOK sinks a Japanese trawler with her deck gun. PTO - New Guinea: Day 25 of 148 of the 2nd Battle of Lae-Salamaua. US 5th and 13th Air Forces provide air support. Atlantic: Planes from the RAF Coastal Command sink five U-boats off the Norwegian coast. Germany: The first transport of Jews from Hungary arrives at Auschwitz. Adolf Eichmann also arrives to personally oversee and speed up the extermination process. Russian Front - North: Day 105 of 191 of the Battle of the Narva Isthmus, Estonia. Both German and Soviet troops remain in their defensive positions. Russian Front - South: Day 39 of 60 of the Battle of Romania, 1st Jassy Offensive. MTO - Italy: Day 121 of 123 of the Battle of Monte Cassino. RAF and US Air Forces provide air support. Day 6 of 8 of Operation DIADEM. The British 8th and US 5th Armies quickly push through the Gustav Line in an effort to isolate Cassino. The Polish 2nd Corps gets in position to take Monte Cassino. MTO - Italy: Day 116 of 136 of the Battle of Anzio. RAF and US Air Forces provide air support. CBI - Burma: Day 73 of 166 of the UK's Operation THURSDAY. CBI - Burma: Day 68 of 147 of the Battle of Myitkyina. US 10th Air Force provides air support. CBI - Burma: Day 46 of 302 of the Chinese Salween Offensive. CBI - China: Day 2,506 of 2,987 of the 2nd Sino-Japanese War. Day 30 of 259 of Japan's Operation ICHI-GO. Day 30 of 39 of the Battle of Central Henan, the first offensive in Japan's Operation ICHI-GO. CBI - India: Day 70 of 118 of the Battle of Imphal-Kohima. The Japanese start putting together a two-pronged attack toward Bishenpur. PTO - Marshall Islands: The US 7th Air Force bombs targets at Nauru and Ponape Islands..
PTO - New Guinea: Day 78 of 80 of the Battle of the Admiralty Islands. 5th Air Force provides air support. PTO - New Guinea: Day 154 of 597 of the Battle of New Britain. US 13th Air Force provides air support. PTO - New Guinea: Day 25 of 481 of the Battle of Western New Guinea. PTO - Solomon Islands: Day 198 of 295 of the Battle of the Bougainville Islands. US 13th Air Force provides air support. Atlantic: German sub U-234 surrenders at Portsmouth, New Hampshire. When the war ended she was already en route to Japan with an extremely important cargo, which included technical drawings, an ME-262 jet fighter in crates and 550 kg of U-238 uranium ore for atom bomb development, along with several high ranking German technological experts and 2 Japanese officers. UK: Alderney of the Channel Islands is reoccupied by British troops taking the German garrison of 3,200 troops prisoner. CBI - Burma: Day 2 of 2 of the Battle of the Malacca Strait. Fighter planes from the HMS EMPEROR sink the Japanese cruiser HAGURO in the Malacca Strait off the Malay Peninsula. CBI - China: Day 2,871 of 2,987 of the 2nd Sino-Japanese War. Day 46 of 91 of the Battle of Zhijiang. US 14th Air Force provides air support. Day 38 of 60 of the Battle of West Hunan (near Zhijiang). Japanese troops continue withdrawing from southern China. PTO: After not responding to communications since 9 Apr 1945, the USS SNOOK is presumed lost. PTO - Dutch East Indies: Day 16 of 52 of the Battle of Tarakan Island. PTO - Formosa: US 5th Air Force B-24s bomb Shinchiku. PTO - Japan: Day 46 of 83 of the Battle of Okinawa. The US 77th Division takes "Chocolate Drop Hill." PTO - New Guinea: Day 506 of 597 of the Battle of New Britain. US 10th Air Force provides air support. PTO - New Guinea: Day 390 of 481 of the Battle of Western New Guinea. US 10th Air Force provides air support. PTO - Philippines: Day 208 of 299 of the 2nd Battle of the Philippines, aka the Liberation of the Philippines or the Philippines Campaign. PTO - Philippines: Day 153 of 244 of the Battle of Luzon. 5th Air Force provides air support. PTO - Philippines: Day 68 of 159 of the Battle of Mindanao Island. 5th Air Force provides air support. PTO - Philippines: Day 60 of 135 of the Battle of the Visayas region. US 5th and 7th Air Forces provide air support. China: Zhao Chengshou surrenders to Chinese Communist forces at Jinzhong, Shanxi, China. Like virtually every other aspect of American life, baseball was affected by WWII. Many of its players left the playing field for the battlefield, but the game continued, played by those who stayed behind, entertaining a nation in desperate need of a diversion and a morale boost in a time of crisis.